"Household income is a measure of the combined incomes of all people sharing a particular household or place of residence. It includes every form of income, e.g., salaries and wages, retirement income, near cash government transfers like food stamps, and investment gains. This map example shows 2007 median household incomes in the states and mainland territories of the Commonwealth of Australia. 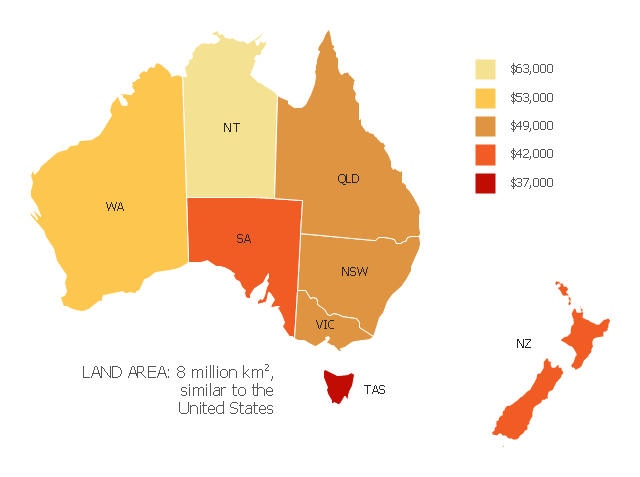 The thematic map example "Map of median household income in Australia" was redesigned from the Wikimedia Commons file: Map of median household income in Australia.PNG. New Jersey is a state in the Northeastern and Middle Atlantic regions of the United States.